VDNKh (VDNH) is an ideological ground of the Soviet Union that has existed for several dozens of years. 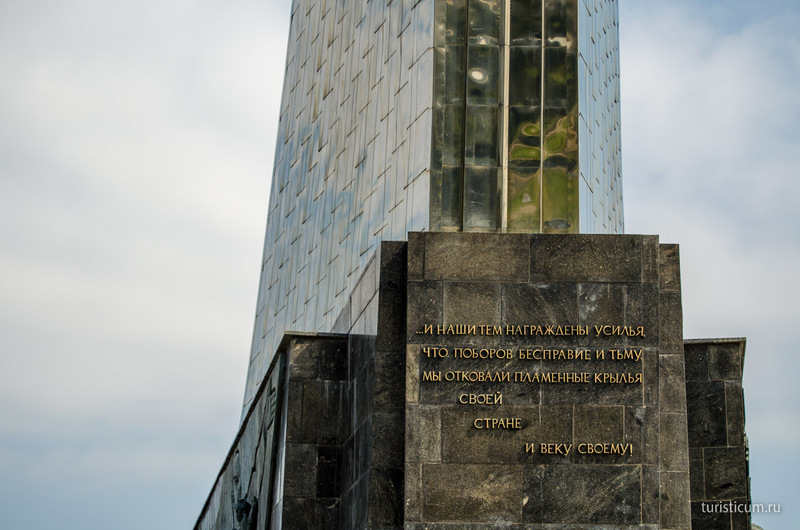 One could find there all meaningful achievements of USSR union republics. 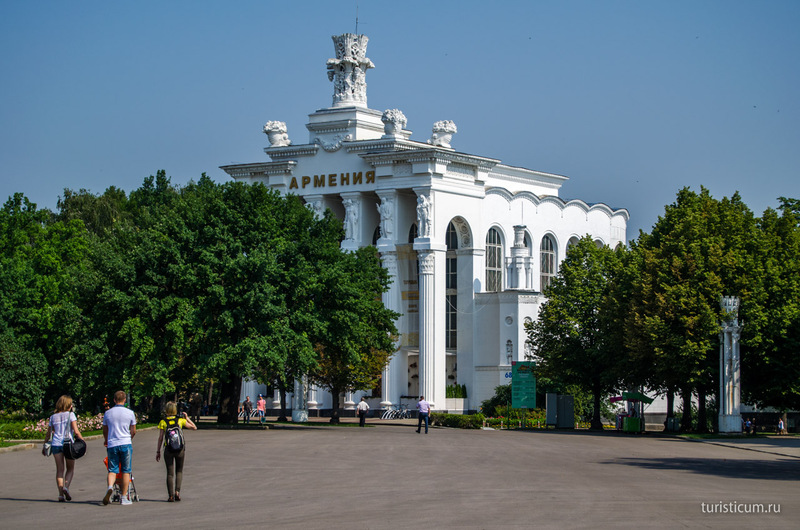 Nowadays VDNKh (VDNH) is a cultural showground with many exhibitions and expositions. 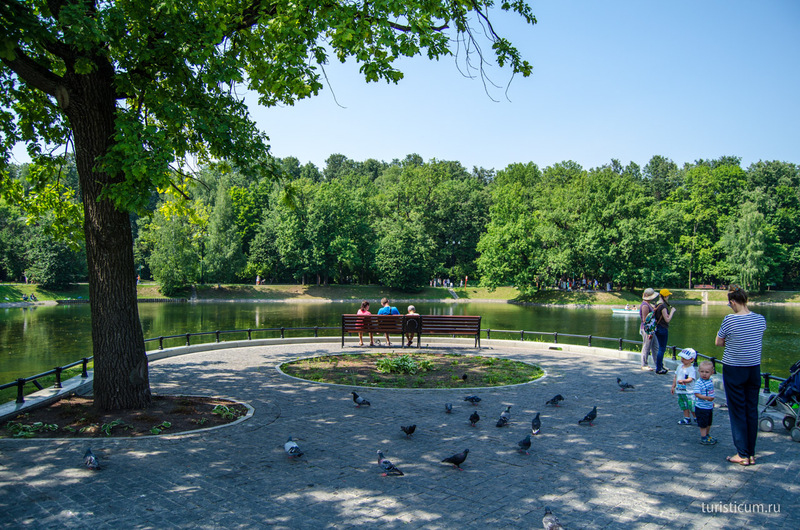 It is also pleasant to slowly stroll along valleys here, enjoy beautiful fountains, and visit City Farm and Landscape Park. VDNKh (VDNH) occupies a vast territory with 10 entrances along it. 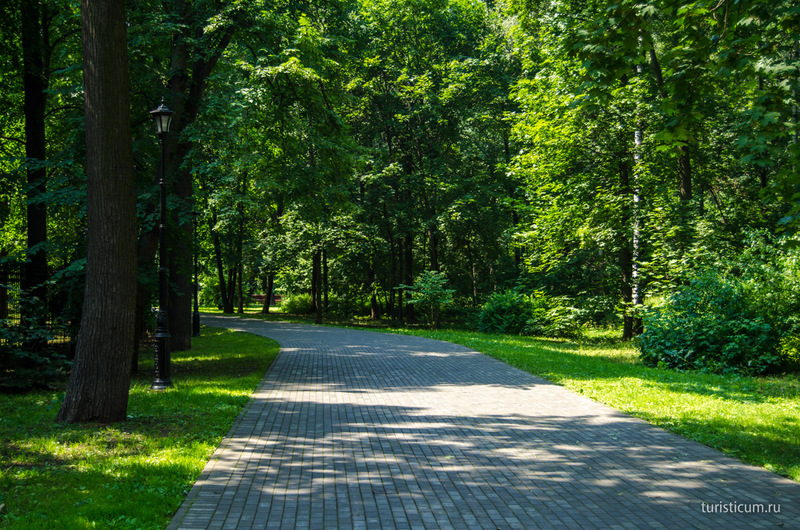 The central alley is the most interesting and convenient way to begin a visit there. The symmetry of buildings impresses with its scale. So it is better to enter VDNKh (VDNH) through its main entrance next to VDNKh (VDNH) metro station. VDNKh (VDNH) metro station is on the Kaluzhsko-Rizhskaya Line which is orange on the scheme. 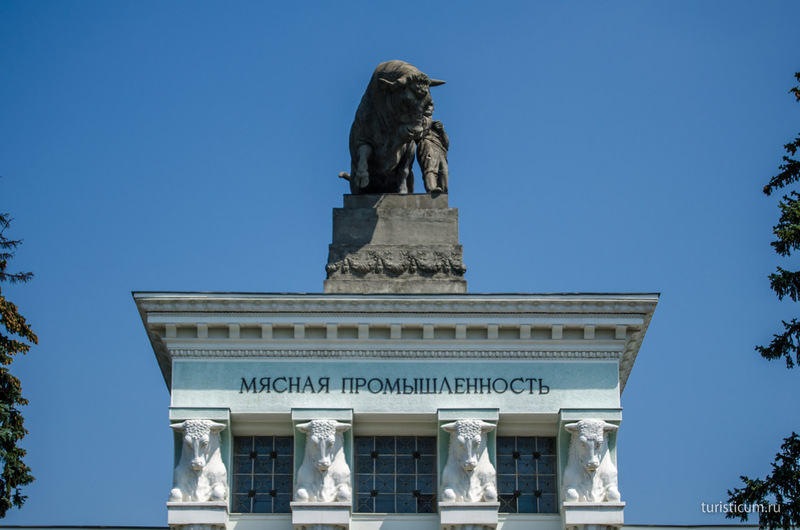 The metro station as well as the exhibition of the nation’s economy are in the north of Moscow. 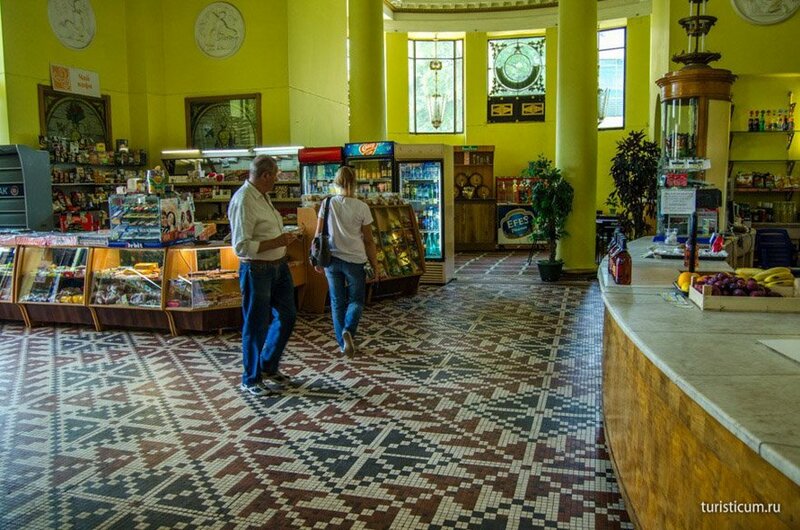 Anyway, do not hurry to visit VDNKh (VDNH) right after you leave underground. 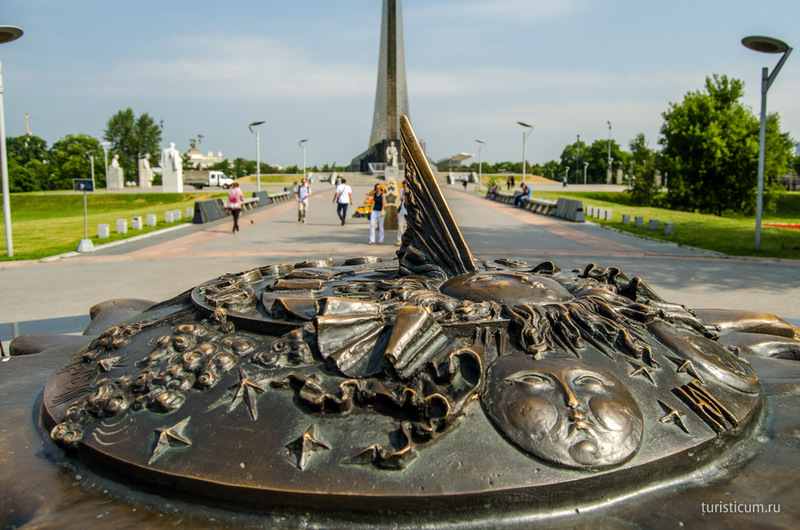 You should start with a walk along park devoted to soviet cosmonautic achievements. 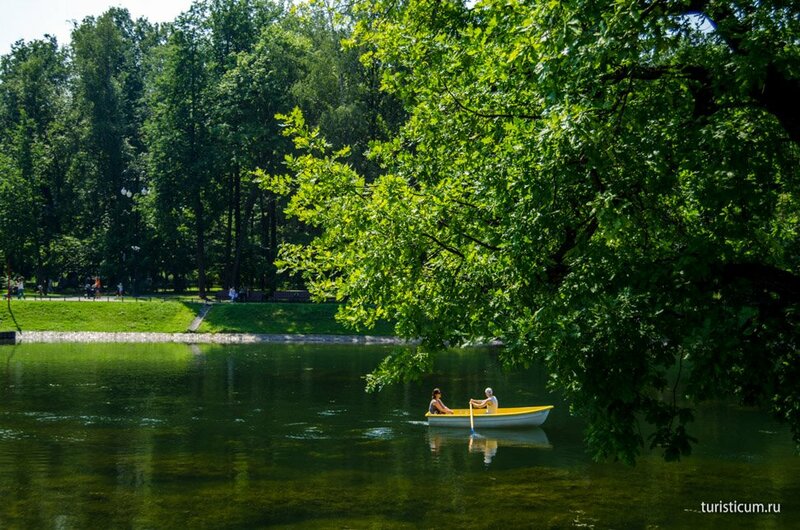 The park as we see it now opened its doors in 2008, though its main attractions took their places over 50 years ago. 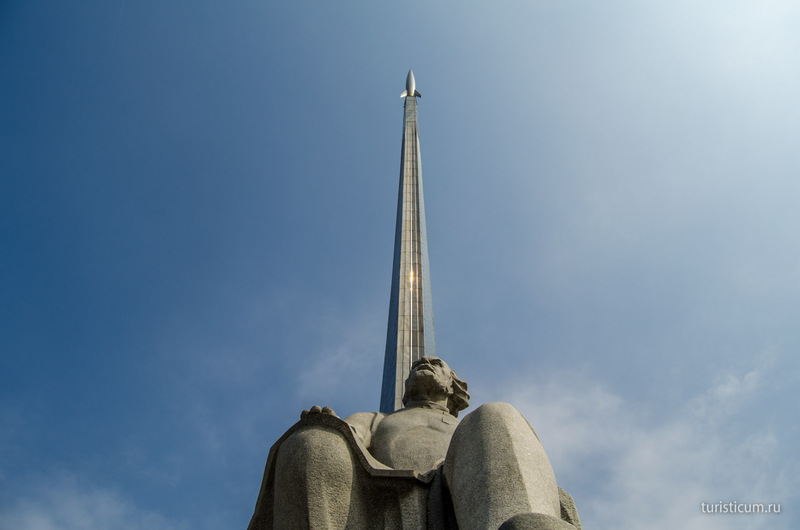 The needle “To Space Conquerors” has been here since 1964. 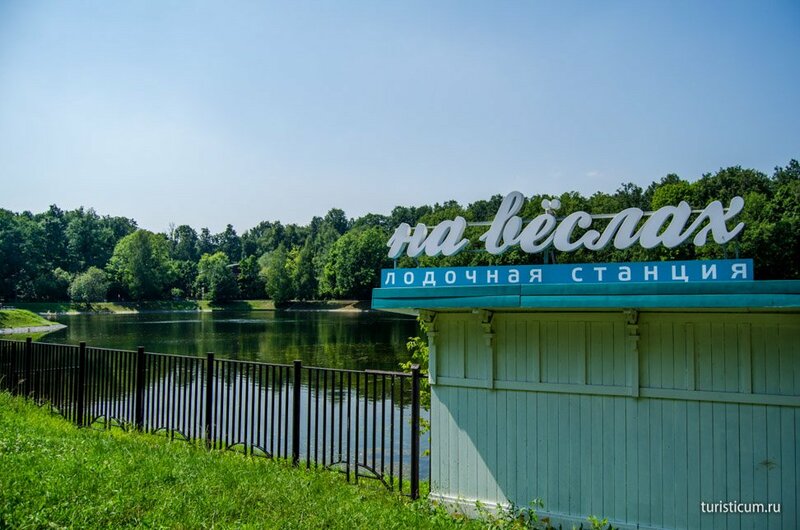 There is its exact copy, in smaller scale, in Saratov Region on the place where Urii Gagarin landed after his first flight to space. 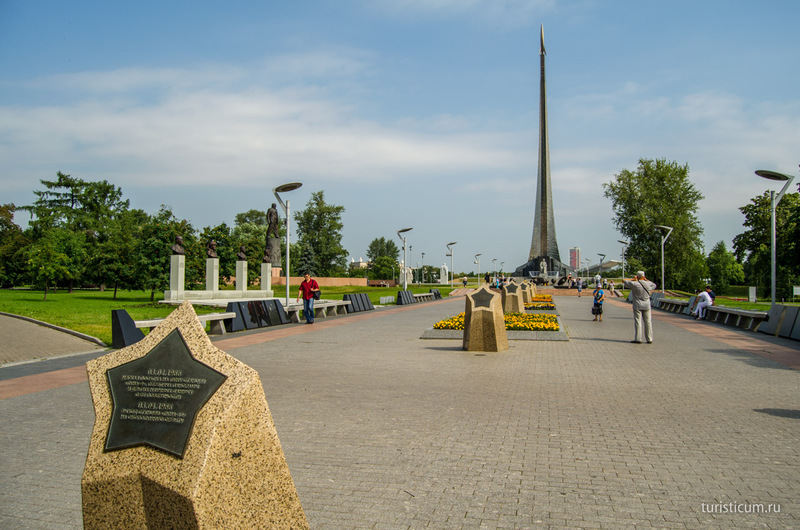 People first saw the renewed alley in 2008 after the Solar System and monument to Korolev appeared there. On the right from the Cosmopark one can see the famous hotel Cosmos. The recently renovated Cosmonautic Museum has opened its doors to visitors on the underground floor of the needle. 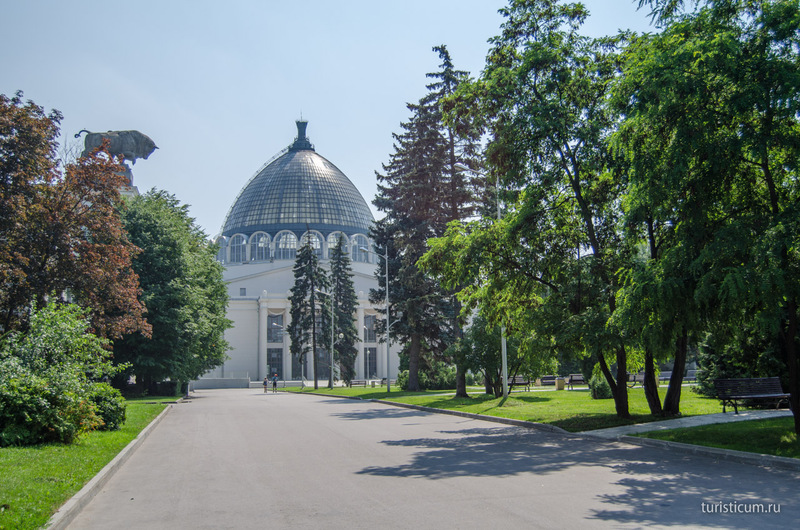 VDNKh (VDNH) is a unique exhibition that exists since 1954. 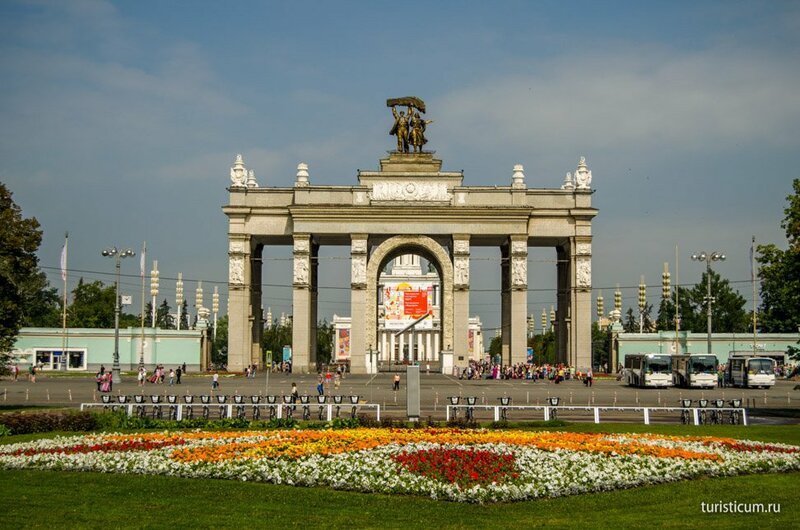 It is a symbol of all the achievements of USSR people’s republics. 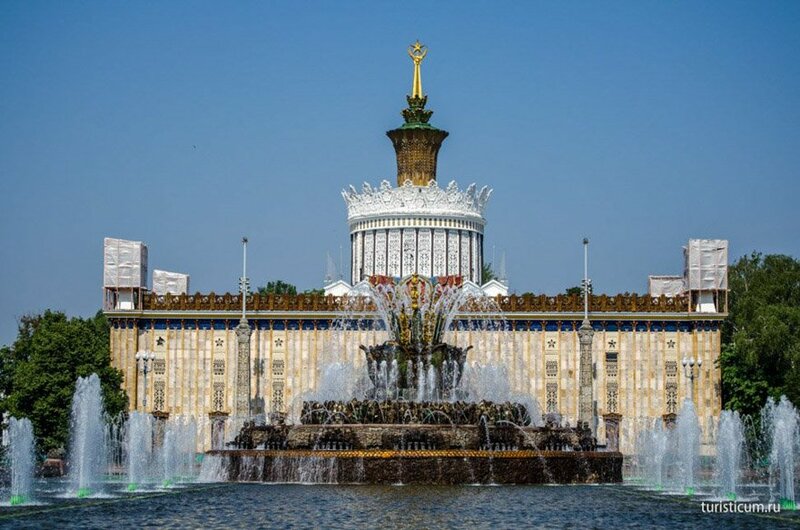 The complex consisted of themed pavilions for each of the union republics where the latter exhibited their most outstanding achievements. The exhibition still functions. 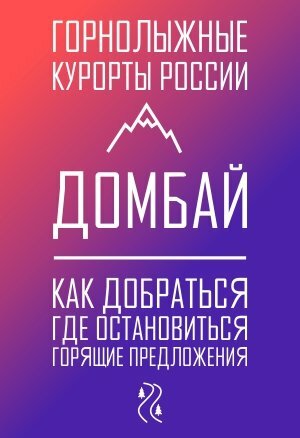 Information on all the exhibitions and official events is on VDNKh (VDNH) official web-site. Fountain alley begins right from the central entrance on. 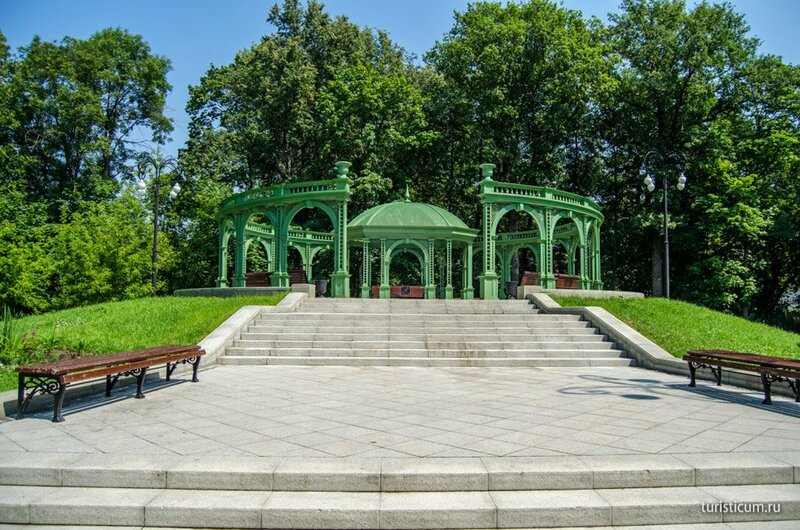 The beautiful alley with small fountains on its both sides takes us right to the VDNKh (VDNH) main pavilion, which is called Pavilion #1 “Central”. 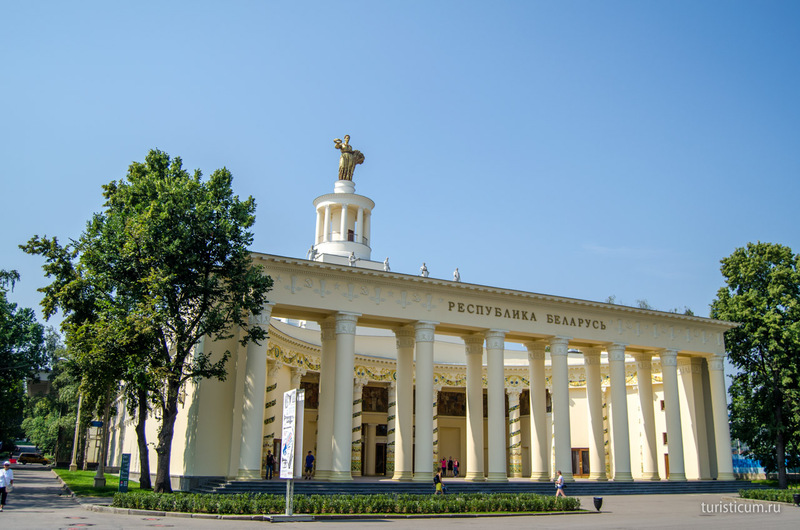 This pavilion used to exhibit the main achievements of forming socialist state. 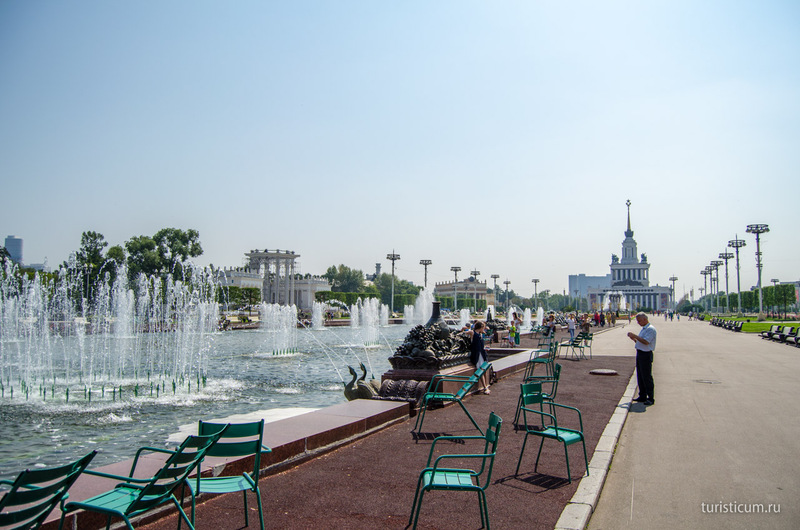 One immediately faces the main fountain of the Soviet Union right behind the Pavilion #1. 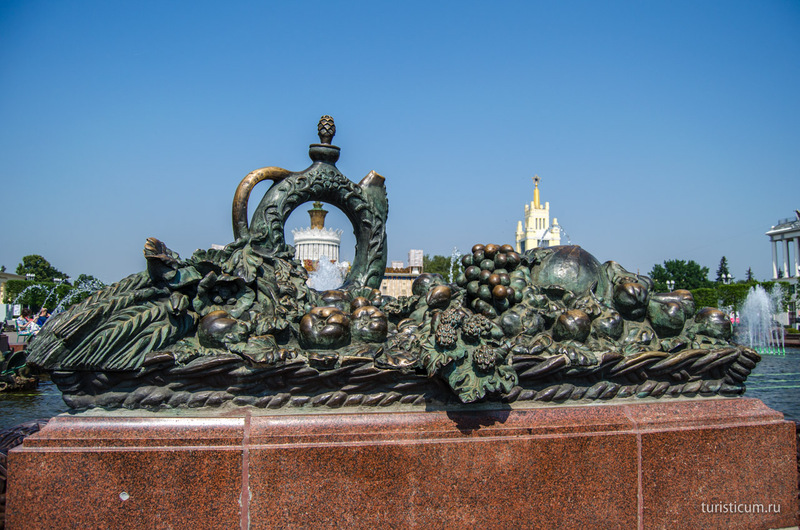 This is the “Friendship of the People” fountain. 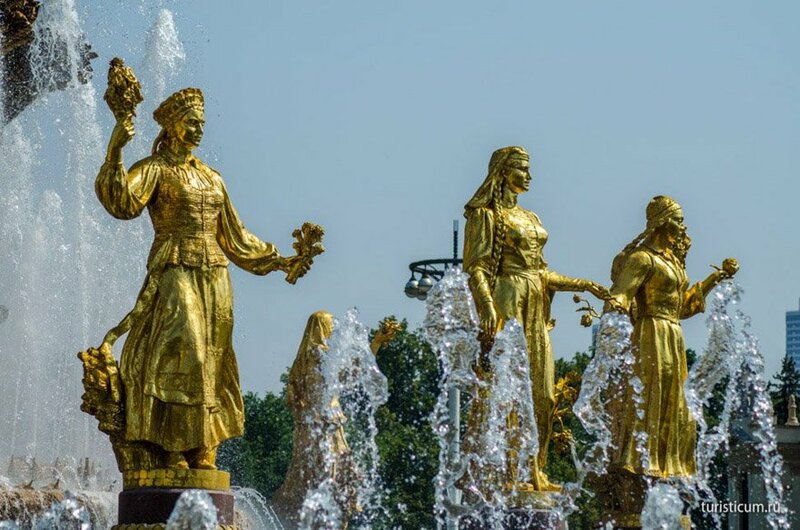 The sculptures of the fountain picture all the union republics of USSR as young girls dressed up in national costumes and with emblems reflecting unique nature of each republic. 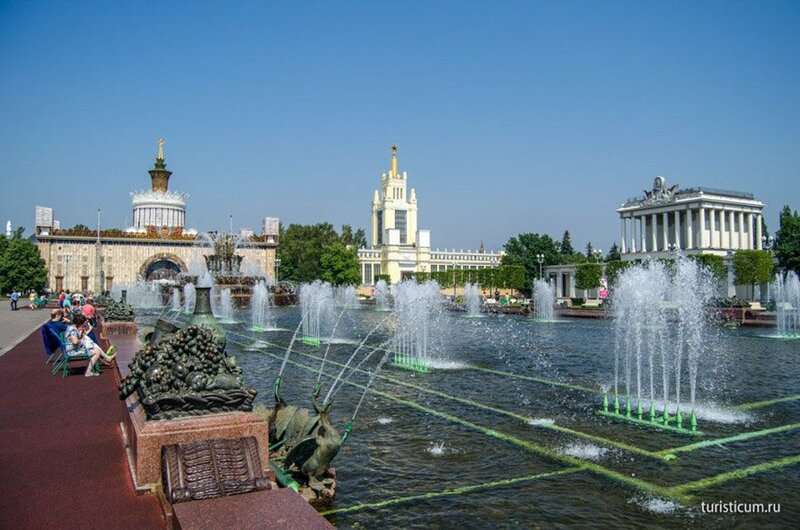 The main pavilions exhibiting achievements of people’s economy surround the fountain at a distance. “Friendship of the People” fountain started to operate in 1954. There is one curious fact about it. There are 16 sculptures of girls around the fountain and this number corresponds to the exact quantity of SSR republics before 1956. Meanwhile, the Karelo-Finish SSR was abolished and renamed into Autonomous Republic of Karelia. 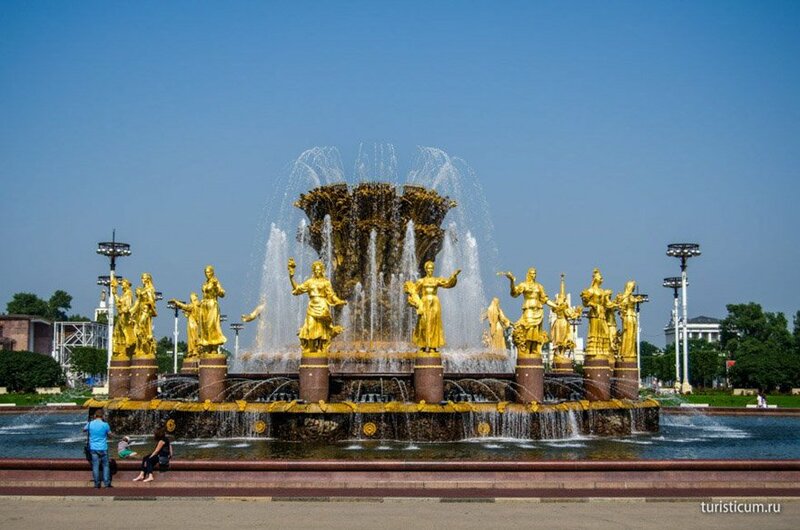 As a result the fountain depicts one extra girl. It remained its place in order not to break the composition of the fountain. 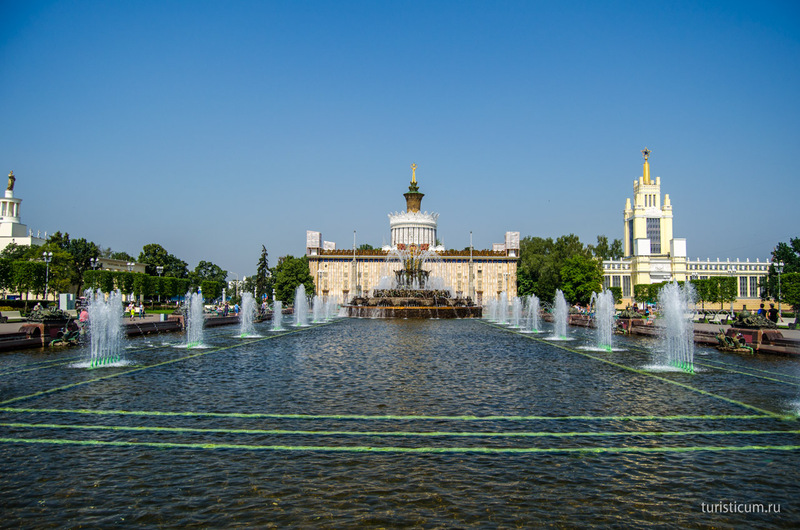 But now this fact will certainly make it more interesting for you to explore the sculptures of the fountain. At the same time it is extremely complicated to find the mysterious girl. So here is a scheme for you to find it. 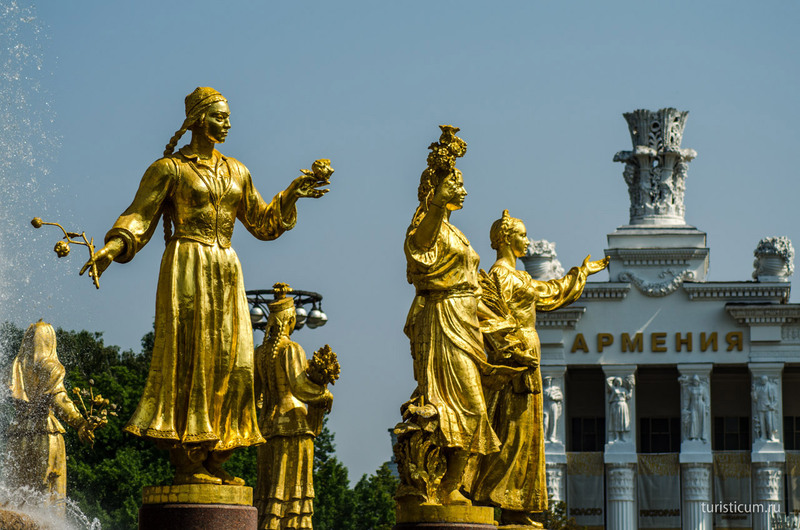 Three girls face the central entrance and the main VDNKh (VDNH) pavilion: Ukraine, Russia and Belorussia. The Russian girl is recognized by a huge stack of spikes in her hands. 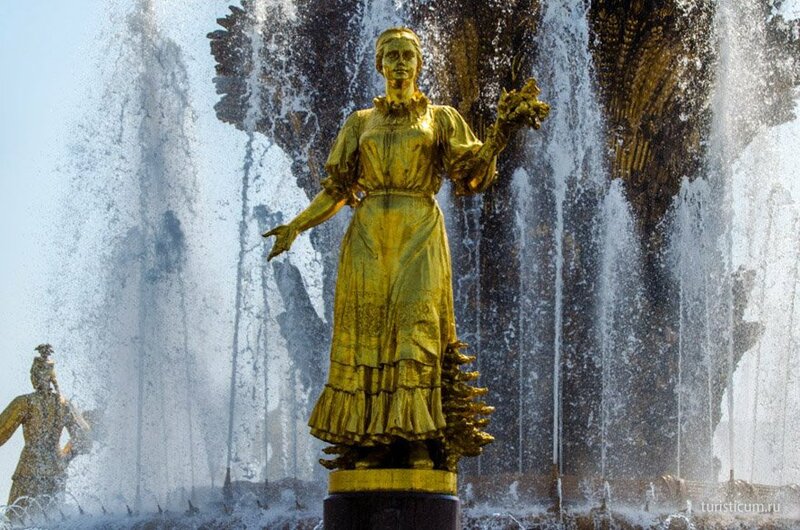 The looked for Karelo-Finish girl is at the opposite side of the fountain facing strictly the opposite direction. As a sign of recognition, she has a small fur-tree by her feet. 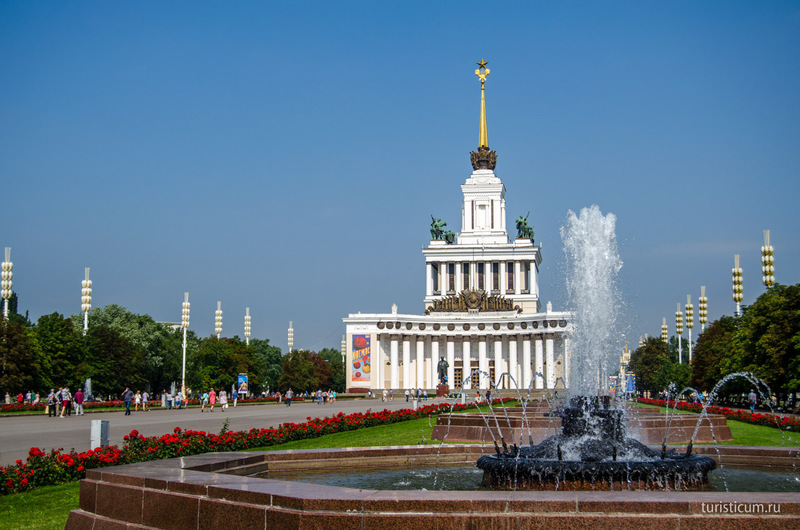 There is Kolkhoz Square right behind the “Friendship of the People” fountain. The beautifully named fountain “Stone Flower” decorates the square. It is the writer Bazhow who invented such a beautiful name. He wrote many fascinating fairy tales including the one about a stone flower. 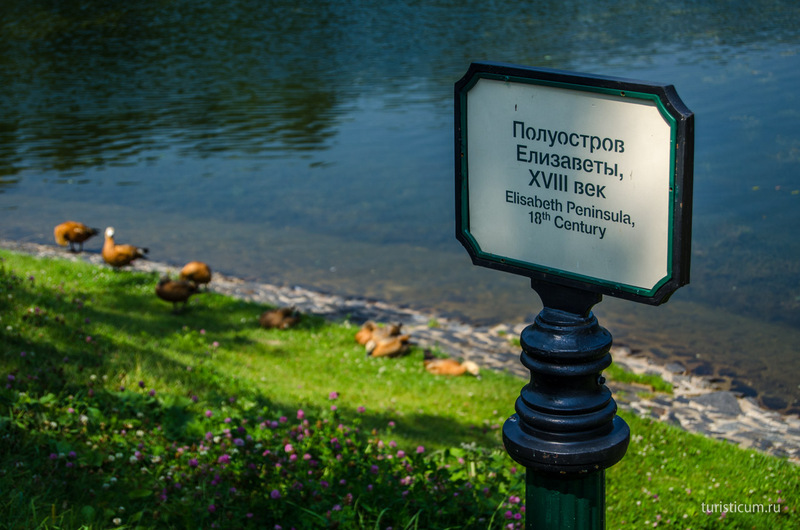 It is not only the name of the fountain that is influenced by “Urals fairy tales”. The central fountain pictures a flower decorated with mosaic and many details. 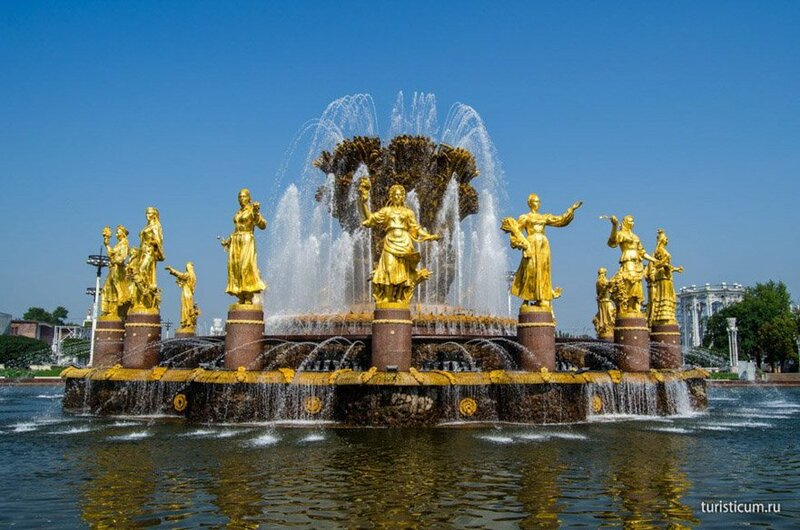 There are decorative bronze viands across the fountain and swans shooting water-sprays. 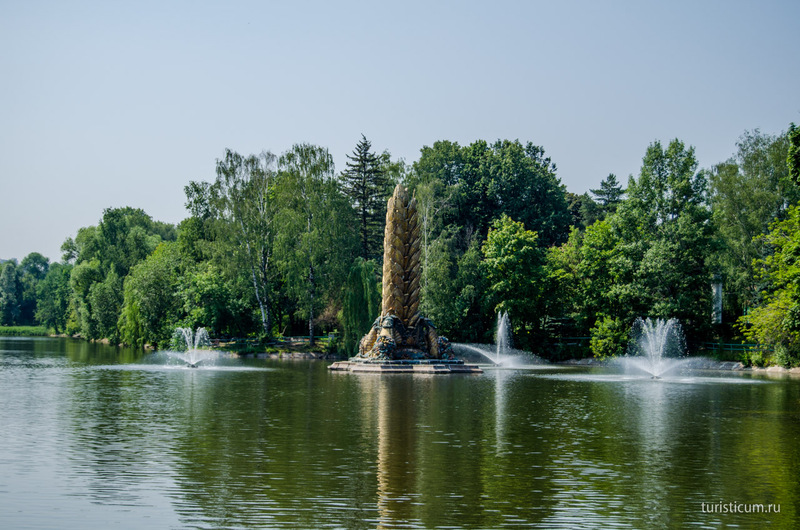 The interesting fact about the fountain is that “Stone Flower” was the first light-and-music fountain in the world. 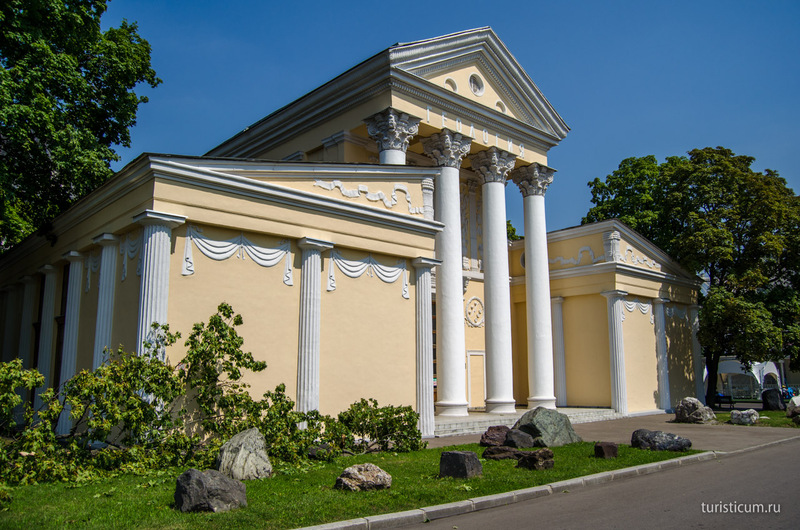 There is pavilion #58 “Agriculture”, used to be called pavilion “Ukraine”, behind the fountain. Pavilion #59 “Grain” is to the right from the fountain. Pavilion #18 “Republic of Belarus” is to the left from the fountain. Moving straight on will take us to Square of Industry with the plane Yak-42, helicopter Mi-8T and fighter plane Su-27. 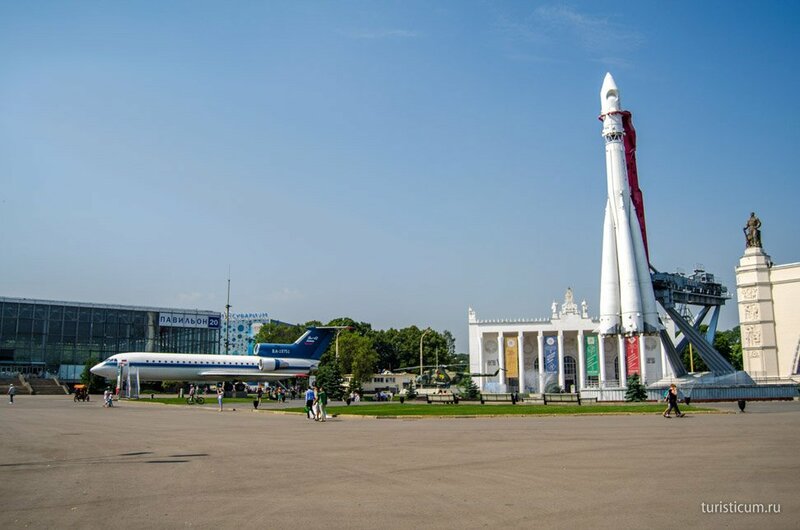 And still the main attraction of the square is space ship “Vostok”. That day was really hot and we came into Gastronome #1 to hide from the sun and replenish with water. On entering the place we felt really nostalgic about our soviet childhood. 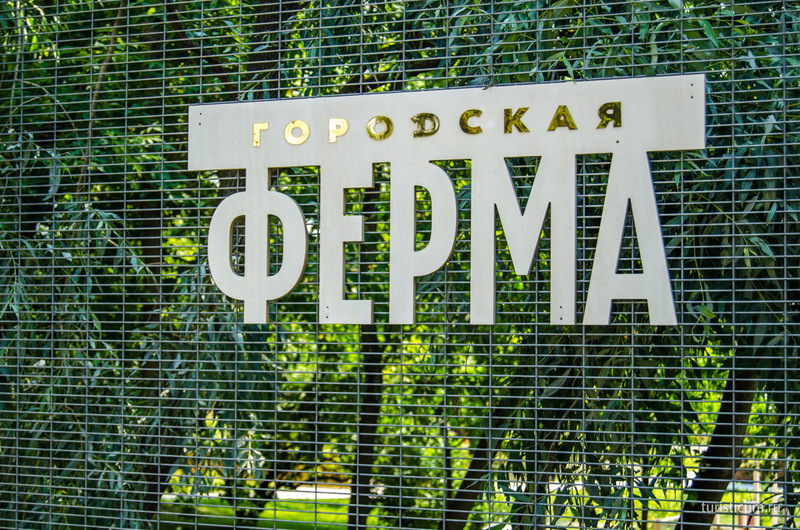 We went further along Arkhitecturnaya Avenue, turned left to Okruzhnaya alley and came to City Farm. The farm has its own official web-site with prices and time-table of all events. In fact the farm is a petting zoo where children can meet farm animals and see the main principles of farming. The farm is also home for numerous workshops and excursions. There is a pond in front of the City Farm. This is one of the four pounds of VDNKh (VDNH) Botanical Garden. The Botanical Garden named in honor of N. Tzitzin is to the right from the pounds. 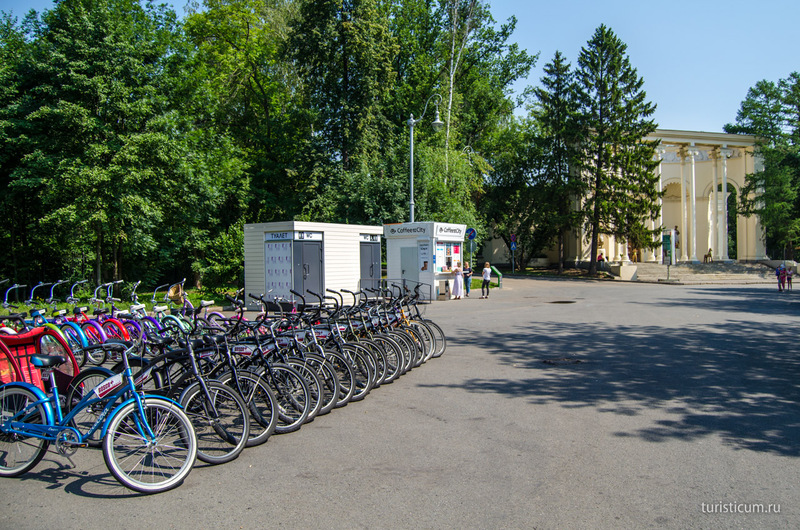 One can ride a rented bicycle along the garden as well as along the whole VDNKh (VDNH). 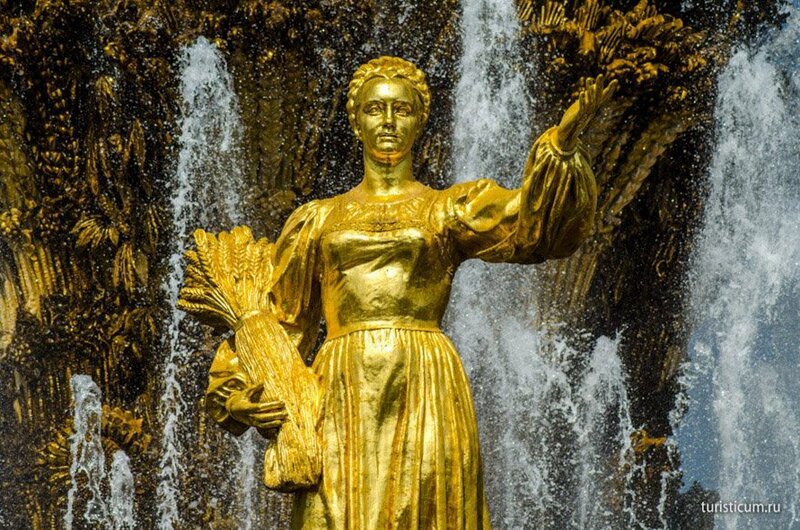 We went to the next pound with the beautiful fountain “Golden Spike”. Just like many others the fountain began operating in the distant 1954. As a result its engineering services stopped working. Reconstruction which could strike life into the fountain has not yet started. We returned back to the main pavilions of the exhibitions from the pounds. One can see pavilion #34 “Mechanical Engineering” from here. There is Square of Industry behind it. 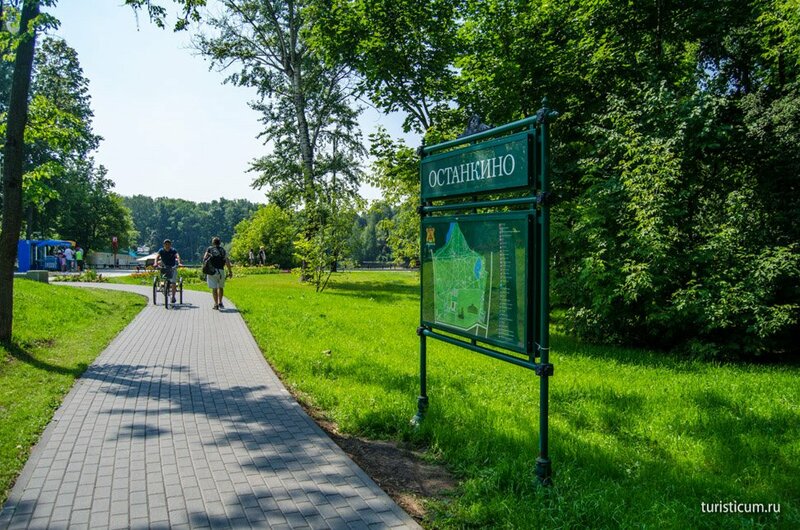 Here we turned towards the Landscape Park and Moscow Mosquarium. 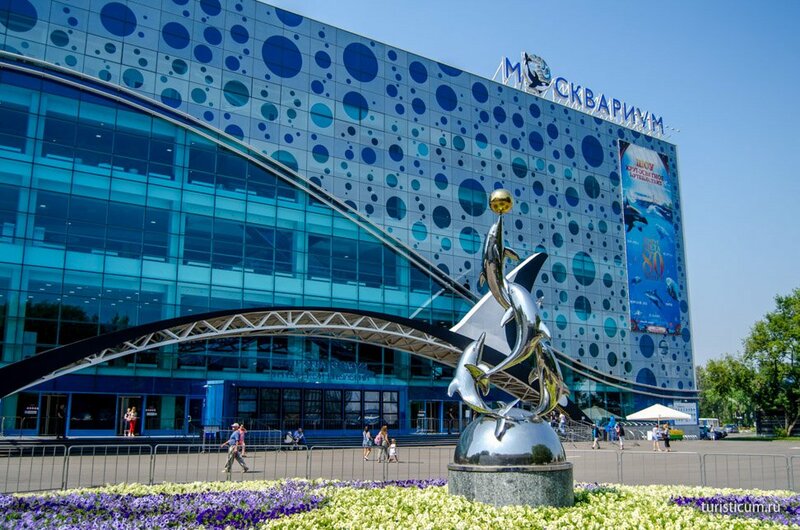 This is the aquarium that has overcome the famous huge Sochi Aquarium by the size. 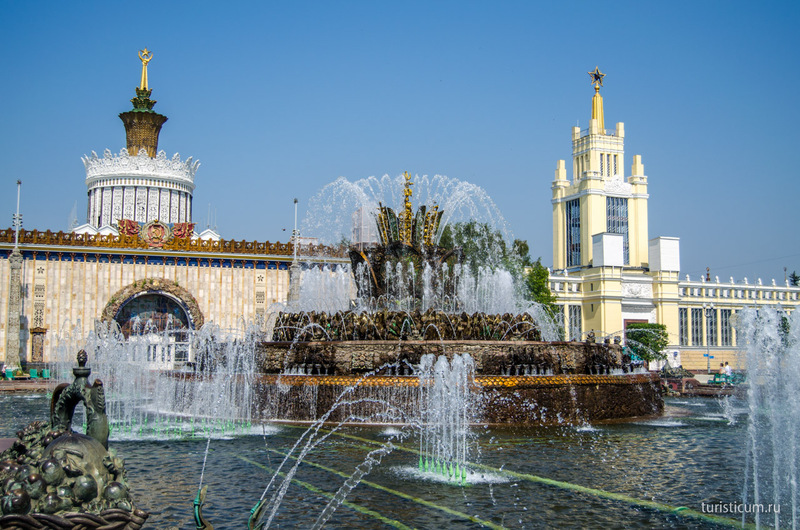 Nowadays Mosquarium is the biggest oquarium in Russia. You can find both prices and numerous events on Mosquarium official web-site. 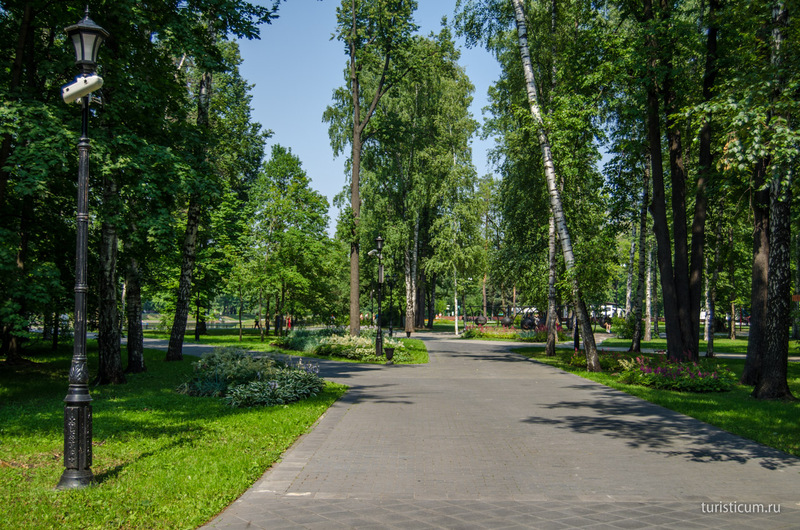 Ostankino Park is very close to Mosquarium. The territory of the park is quite big. 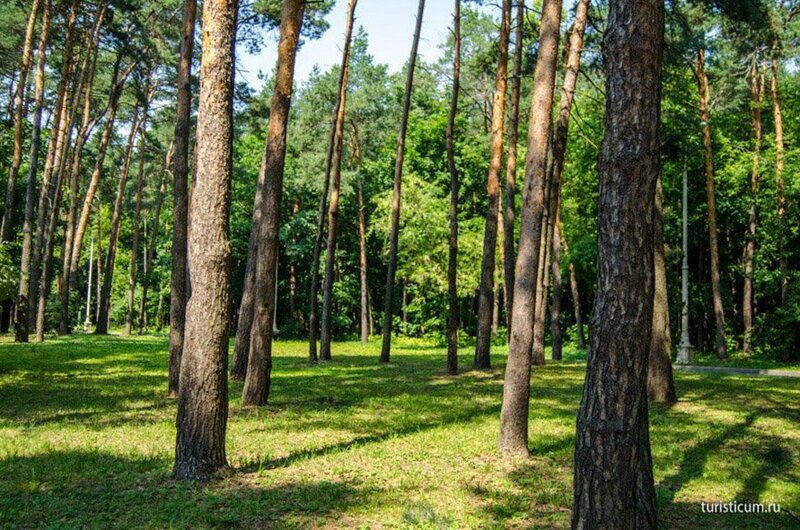 It is pleasant to walk here or just swing. Besides there are landscape approaches in the park that certainly spice it. This is, for example, a belvedere – the word means a gazebo. One can sail along the pound on a boat. The pound itself is very small so you won’t be able to sail too far. 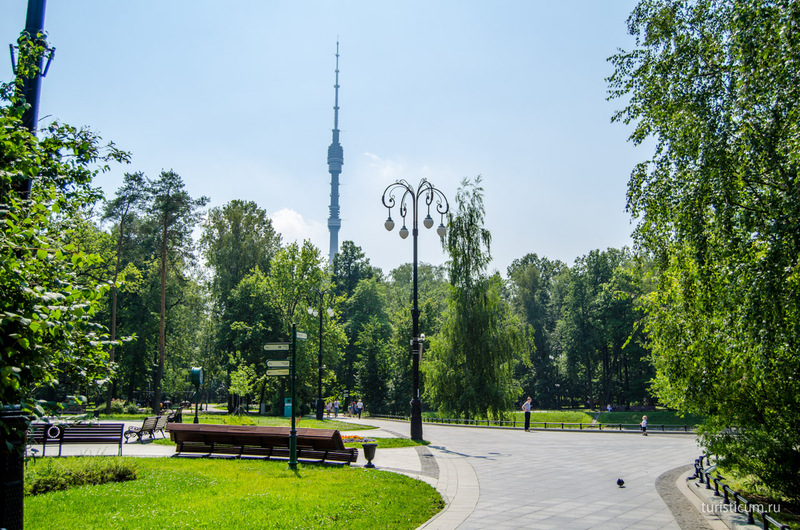 This place, by the way, is very close to one of the main symbols of Moscow – Ostankino Tower. 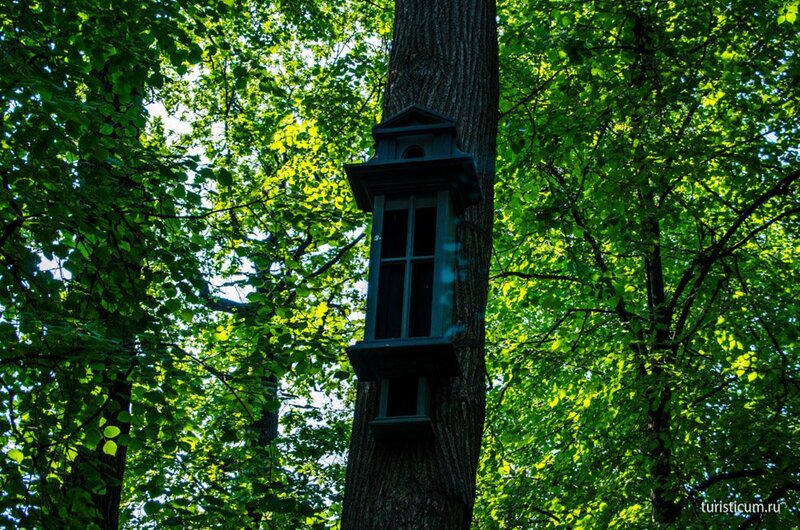 The tower is open for excursions with a visit of its viewing point. We walked along the park a little bit more, but our feet took direction to the exit. 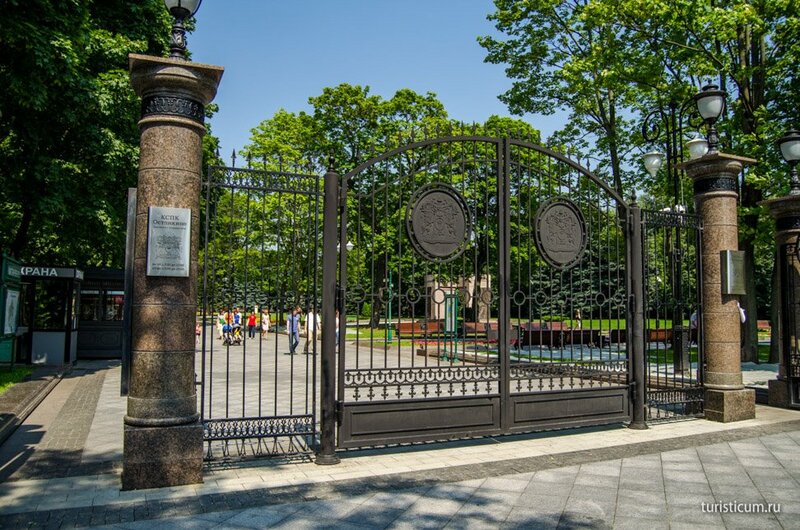 This is the entrance to Ostankino Park. 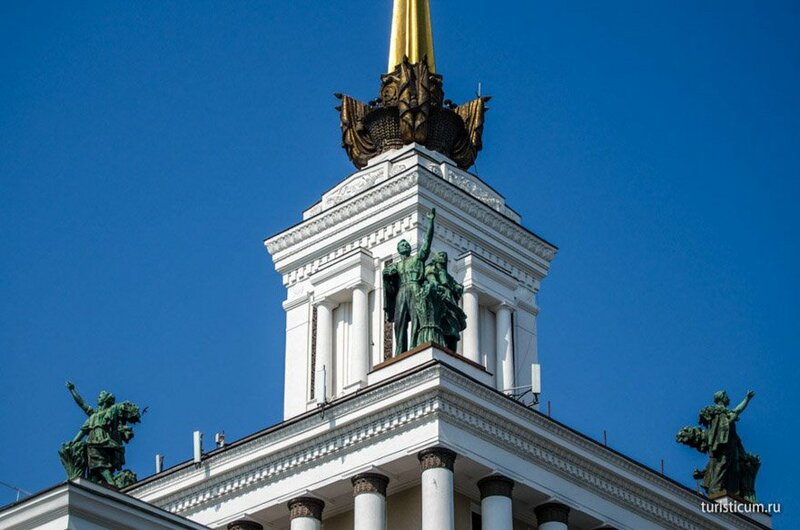 Unfortunately Ostankino Palace is under reconstruction now and the part of its attached territory is closed so the park is only partially functional. 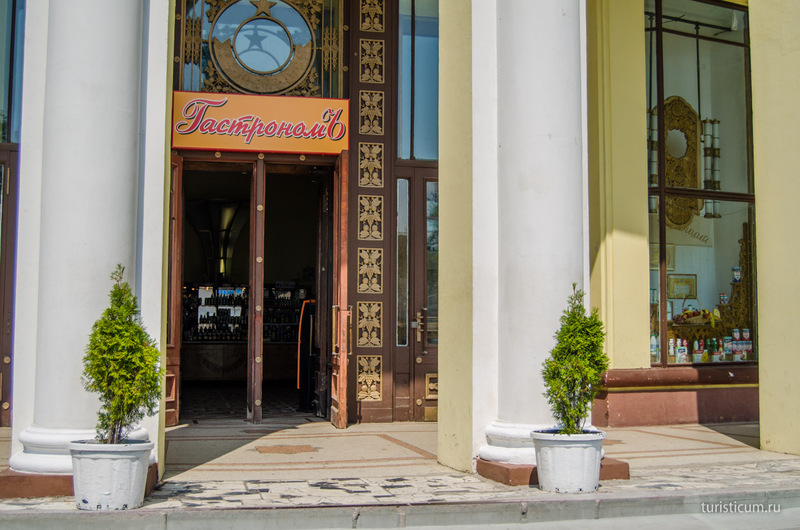 One can walk along VDNKh (VDNH) all day long and will still not be able to see all the pavilions. Numerous stops and visits to exhibitions will only make it more difficult. City Farm and Mosquarium alone will leave no time for the rest of the attractions for sure. And there are also Cosmonautic Museum, Ostankino Park and Ostankino Tower nearby. 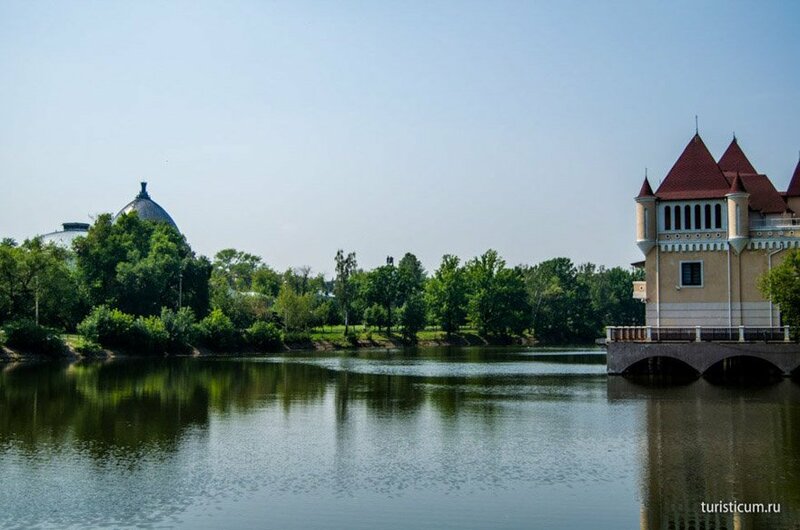 So if you plan to spend in VDNKh (VDNH) only one day, you will have to work hard to make a decision which attractions to visit. We only had a chance to dash like a hurricane along alleys and avenues of the exhibition. 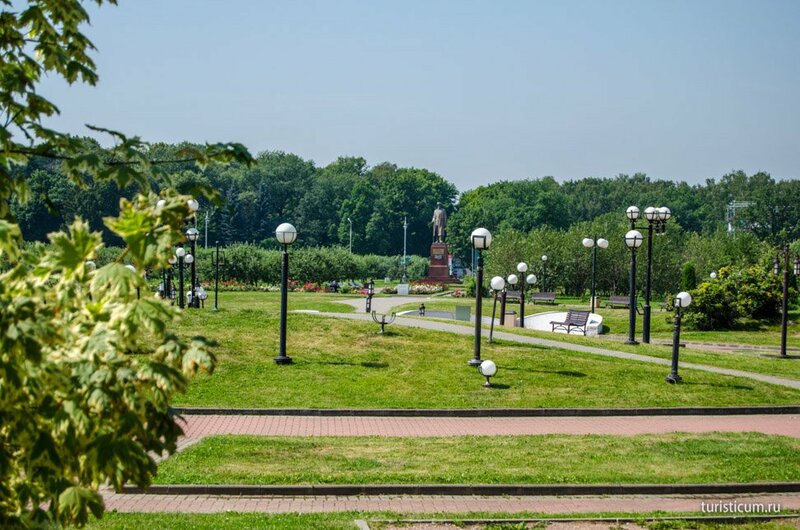 So there is no doubt that we will be back here to visit Mosquarium, City Farm and Ostankino Tower. Besides, we will surely capture the monument “Worker and Kolkhoz Woman” that we missed that time. 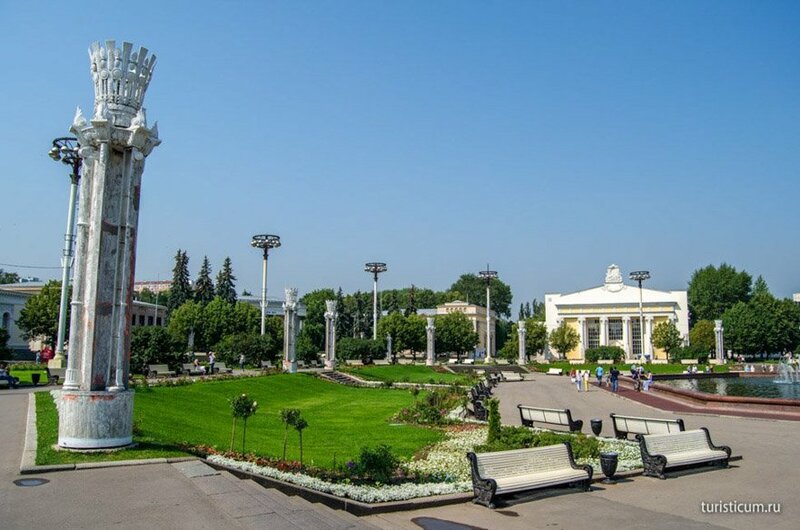 The monument is to the right from the central entrance to VDNKh (VDNH).